Tata Safari Storme could easily pass as a hot SUV with strong liking amongst off-roading fans. With its pure bad boy looks, the Indian army also seems to take a liking to it. The army recently chose Safari as its personnel carrier vehicle over Mahindra and Mahindra and Nissan. Now, Safari Storme is more than a passenger vehicle. Its a prestige for Tata Motors to bag the order over its bitter competitors – Mahindra and Mahindra and Nissan. The biggest competition was with Scorpio as both of the cars offer four-wheel drive option. 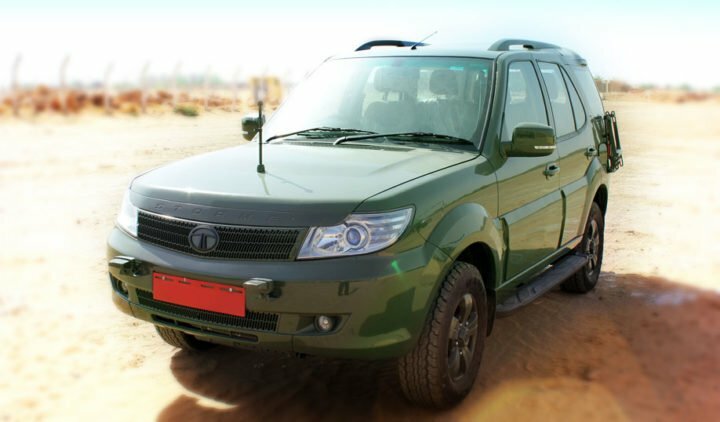 Tata Motors has signed a contract with the Indian Army for supplying 3,192 Safari Storme cars under a new category, GS800 or General Service 800. 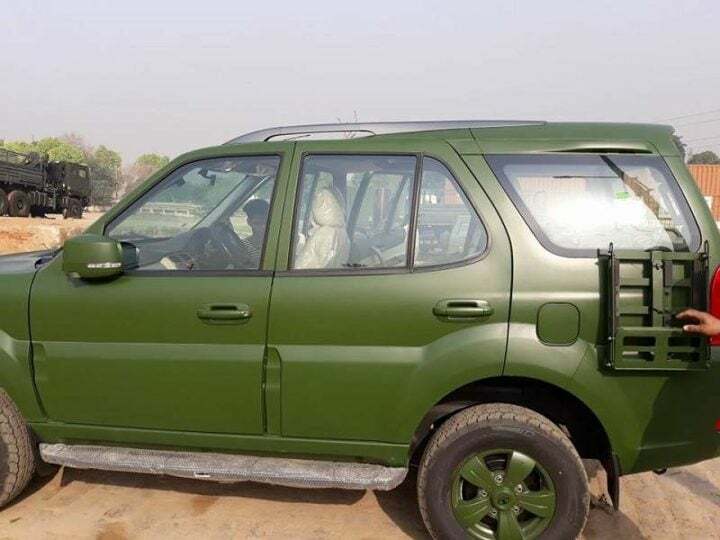 The recent viral images show that the army edition gets a dark green Army shade over a metal sheet body. The roof tails and footstep rail come with a black paint. The rims of the car also get a dark green shade, giving it a proper military look. The exteriors of the army car stay simple without any chrome effect or anything. The rear-left fender also has canister carrier. Other features include spotlights on the front bumper and new antenna on the hood. The exact details of the car are yet to be revealed, but it is said that the car will get beige interiors. Tata Safari Storme is powered by a 2.2-litre 4-cylinder turbocharged diesel engine that produces 154bhp of power and a peak torque of 400Nm. Power is transmitted to the wheels via a six-speed manual gearbox. The Army Edition also has a 4×4 transfer case that offers both low and high ratios. It comes with ESOF (Electronic Shift On the Fly) capability enabling the driver to change from a two-wheel drive to all-wheel-drive at the twist of a switch. 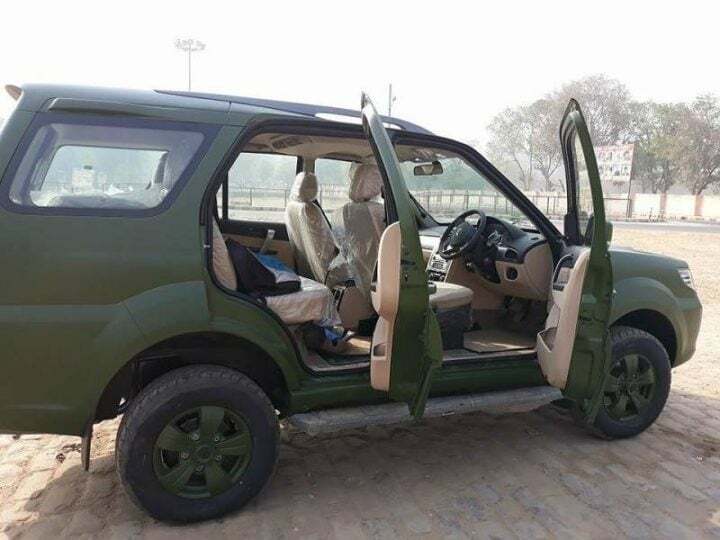 In essence, the Safari Storme will replace the ageing Maruti Gypsy in the Army’s arsenal. The Safari Storme will be majorly used as a personnel carrier, and even for some reconnaissance missions. The high ground clearance of 200 mm and the four wheel drive mechanism allows the Safari Storme to easily travel in the roughest of terrains.